Almond Milk Beeswax Hand Creme -Help for hard-working hands! Pure help for hard-working hands. This super rich, all-natural hand cream is made with sweet almond oil and vitamin E to moisturise dry skin and beeswax to help seal and shield your hands from the elements. With such a sweet scent, you'll always be reminded to feed your skin with the nourishing care. How to Use: Smooth a small dollop of cream onto freshly washed hands. Use after every handwashing. Ingredients: Prunus amygdalus dulcis (sweet almond) oil, water, beeswax (cire d’abeille), aloe barbadensis leaf juice, kaolin, lonicera japonica (honeysuckle) flower extract, tocopherol, lonicera caprifolium (honeysuckle) flower extract, nonfat dry milk, carrageenan, glycine soja (soybean) oil, stearic acid, sodium borate, citric acid, sodium phytate, sucrose, alcohol, sodium benzoate, potassium sorbate, fragrance, phenoxyethanol, eugenol, linalool. Great hand cream. Just a small dab does the trick for hours. The only reason I'm not giving a 5-star rating is that the cream feels a little greasy at first; however, that feeling soon disappears. Also, I don't normally buy scented products, but the almond scent is light and unobtrusive. Great product. Super thick, and is amazing for a deep night moisturizer for your hands and feet. I love this hand cream! I am super picky with my hand creams (I hate when they leave a greasy residue) but this one is amazing! I really like the smell too! I would definitely order it again! This is so versatile..hands, cuticles, lips, feet. Smellls.divine divine, leaves skin soft and polished. Love it. Keep a jar in every room and my desk and the car! Buy one, many times! I work in an elementary school so I am constantly washing my hands. I was looking for a natural moisturizer to help save my hands from cracking and bleeding. I have been using this every night before bed and so far the results have been great! I have no had to use any other moisturizer during the day. I find this a very effective moisturizer. I don't *love* the scent, but it's not horrible. I use it every night before bed because I have very dry hands from frequent hand washing (three young children/babies). I have been using this hand cream now for about three years. It was given to me as a Christmas gift. It is by far the nicest hand cream I have ever used. A little goes a long way and it absorbs quickly but leaves my hands feeling very protected. I live and work on a small farm and need a really good hand cream as I wash my hands frequently. This product is it! It is easy to order and delivered promptly. The package is not sealed. The "cream" is like hard stone. Can't use it. Nice scent. Not too strong. Safe and natural ingredients are nice to know. Thick, moisturizing and smells like marzipan! What more can you ask for? Definitely recommended for winter dryness. Love this stuff! And it smells devine!!! At first, I reacted badly to the scent, which reminded me of Christmas cake with almond icing that I found too sweet. I put this away for a little while but took it out again and now just love it. I'm used to the smell now too. It's a fabulpusly good moisturiser. I use it on my feet as well. I find the smell overwhelming and nauseating. Didn't enjoy this cream at all! It didn't absorb into my skin, and I disliked the smell so much I washed it off an hour after I applied it. BEST hand cream for dry winter skin! Psoriasis friendly.Absorbed quickly and left my hand soft and supple.Love the scent! Really greasy and took a long time to absorb into skin, I won't buy it again. I love this product; the moisturizing effect can be seen. And it protecting the skin. I use it at night and in the morning. I love this hand cream!!! I've tried a lot of other creams, and this one is the best. It moisturizes and my hands are so soft. Plus it smells so nice. A great product tha I will continue to use! I love this product. I use it at night, and it's a nice thick cream that just "feels" like it's doing a good job of moisturizing. I love the almond scent. I like that it comes in a jar and not plastic. It is rich, thick, and paste-like. Loses one star because it takes a bit to absorb into the skin. I'd definitely recommend this product. It does the job. I bought this in replacement of Kiehl's Hand Salve. In relation to that product I was disappointed. It was greasy and took a long time to soak in. It did work better than your average hand cream but I had to use a lot for my dry chapped hands. The smell was great. 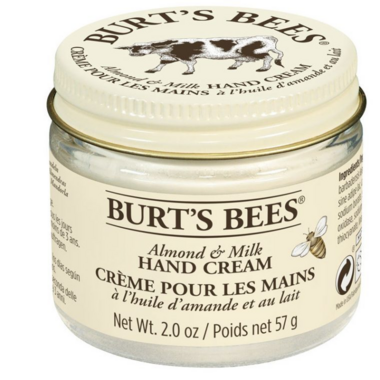 If you have dry chapped hands this will work better than regular cream but it isn't something you can use throughout the day since it is greasy. I would recommend using it only at night. Really good hand cream. Love the scent, it is fairly strong, but pleasantly sweet. I wash my hands a lot between working in a hospital and having two preschoolers at home, my skin is always dry and splitting. I put this cream on before going to bed, problem solved. My hands almost never split now. Wonderful product. This hand cream is great! It does go on pretty greasy but it soaks in & I only use it at bedtime so that part doesn't bother me. It's very moisturizing & the scent is nice too. I will buy it again. great product, smells nice however it is a bit oily, it does relieve the dryness of my hands but you have to use a bit more. I use it for my heels, not my hands, it works much better than those derma stuff that costs 3 times the price. love the scent of the Almonds too. This is the best hand cream I have ever used, most hand creams seem to just sit on the top of the skin, and don't absorb in to the skin and condition the skin like this product. This is extremely useful in the dry Winter months. This product is awesome! The smell is a little strong at first, very sweet smelling, but only when the jar is open. When it's on your skin the scent is quite mild. Very moisturizing. I use it at night with a pair of cotton gloves and it's fantastic. The first time I did it my husband laughed at me, told me I looked silly, but in the morning he was actually shocked at how soft my hands were. Now if it's been a couple of nights since I've used this, he reminds me and makes sure that I use it. It works wonders. I love this product. It is very dry where I live and it is the only product that keeps my hands from cracking during the winter. Smell great but nice applied, the smell changes to something unrecogniable... won't buy I again. Have tried other brands that work better. This cream has a great smell and works really well as a thick moisturizer before bedtime. My only gripe is that it has fragrance as an ingredient, but it's a good cream nonetheless. Love this hand cream! Only issue is I tend to use more than needed because atfirst it doesn't seem like you have enough but as it warms up, it soaks into skin and spreads! Wonderful smell (like the banana cream, too but this has a nicer smell). I love this cream! If you get bouts with eczema, give this one a try. This is a very rich cream. I have chronic Atopic hands and find it helps to keep them somewhat soft. My hands serious thick skin though and someone else with regular skin may find it a tad greasy. This cream smells awful! So different from other Burt's Bees products. This hand cream melts into your skin and provides instant moisture like no other hand cream I've ever tried!